It’s difficult to understand how this case isn’t reverse domain name hijacking. There are quite a few UDRPs that sure seem like reverse domain name hijacking but panelists decline to find it. They often give generic reasons for denying reverse domain name hijacking. The latest candidate is a decision by panelist Selma Ünlü with Czech Arbitration Court over the domain name BankSanPaolo.com. The Respondent, Pearson Solutions Inc.-Freyr Thorsson, acts on behalf of Core Holdings Ltd which sponsors a charity under the legal name of „Banco San Paolo de Alimentos“ (San Paolo Food Bank). The said charity was conceived in 2014 under the guidance of several Catholic institutions in Latin America, and especially in the Republic of Colombia. As a project, it is directly sponsored by 3 major nonprofit Catholic organizations headquartered in Colombia and a private, for profit, organization established in the island of Curacao, Netherlands Antille. OK, so it’s a non-profit food bank. Makes sense. Panelist “>Selma Ünlü ruled in favor of the complainant on confusing similarity, but against it on the latter two elements. I’m surprised about the ruling on confusing similarity. The closest trademark I can see is “BANCA INTESA SANPAOLO”. I guess that’s confusingly similar. Regardless, based on the information provided in the Czech Arbitration Court ruling, this seems like a clear case of a well-intentioned group registering a descriptive domain name for a legitimate use. The complainant sent a cease & desist to the domain owner. When the domain owner “didn’t comply”, it filed the UDRP. …the Panel finds that the Complaint was not brought in bad faith and did not constitute an abuse of the administrative procedure. The Panel notes that lack of success of a complaint is not itself sufficient for a finding of Reverse Domain Name Hijacking. Although the Complainant’s arguments under paragraphs 4(a) (ii) and (iii) of the UDRP Policy failed, they did not fail by such an obvious margin that the Complainant must have appreciated that this would be the case at the time of filing the Complaint. That sounds like a generic cut-and-paste excuse to me. 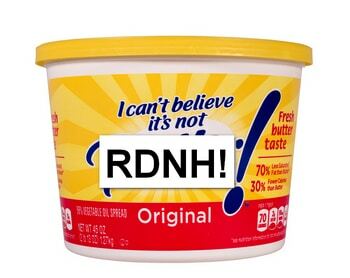 Perhaps there is a good reason to not find RDNH. Perhaps the website on the domain name wasn’t created until after the dispute was filed. (My research suggests this might be the case, but it’s unclear.) And sure, the name in Whois doesn’t identify the respondent as running a charity. But with Ünlü’s stated rationale of “not [failing] by such an obvious margin”, I have to disagree. The case failed miserably. You’ll have to start a “I can’t believe it’s so good” as well, for the UK folks. I was one of the counselors in this case on behalf of the Holy Church. We brought forward evidence proving that it was not RDNH, carefully studying Intesa’s trademark registrations in South America. There is no trademark for “San Paolo” in Latin America, only “Intesa”. Banca San Paolo, the institution that Intesa absorbed after the merger, had only registered its trademark in Argentina, where the food bank had no operations. The domain was acquired in good faith. Intesa’s attorneys couldn’t prove that the mark was registered. We also brought evidence from local authorities discarding Intesa’s arguments. These and many other details weren’t mentioned by the panelist in her decision, but I’m sure they were taken into account for her fair ruling.